Hippeastrum 'Benfica' flower bud. I actually still have a tag for this one. What can I say; it's new. 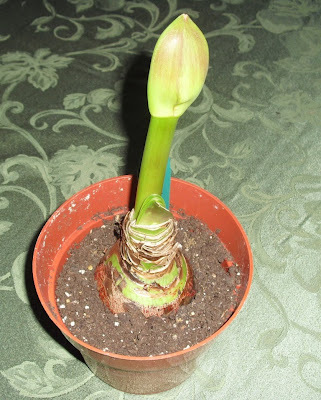 It is my first "Amaryllis" bud of the season. Actually, this plant could be the only one that blooms anywhere close to the holiday season. For the past couple of years, I haven't been forcing my Hippeastrum bulbs. They are in the coolish basement, true, but I haven't cut back their foliage, or placed them in the dark. I have skipped this because I noticed that the bulbs were getting progressively smaller. I hoped that a couple of years of holding on to as many leaves as possible, year-round, would help them store up energy. Without forcing, many of them bloomed in spring last year, in April and May. I don't mind this at all; I'll take those beautiful flowers at any time. A few didn't bloom at all. That's fine, as I assume they will eventually, when the bulbs have been replenished. I'll be sure to post pictures of H. 'Benfica' when it blooms. It'll be a dark red. I have another of these, and when it bloomed, it was stunning. And to anyone who is wondering, given my post yesterday, and my opening sentences today: I don't have Seasonal Affective Disorder (SAD). I'm pretty much my usual self, mood-wise, during the winter. I just really hate winter weather. I have the same "problem" with Hippeastrums... and I end up buying more bulbs each year so as to have at least one bloom during the winter. And every year, I forget to stop watering them in time to give them a long enough dormancy time. And then there are those that are so "starved" they've shrunk to plum size.